Not so. 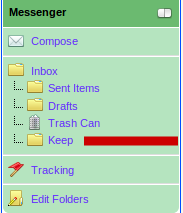 I have a folder named "Keep" exactly for that purpose. You can add a new folder by clicking "Manage Folders"
So now when I click Empty I just tick "Inbox" and "Sent"
We can change the thread if you want ? Then I selected "move" to "keep" and clicked "go"
... Nothing happened. What did I do wrong? You don't need to click Go. #3 Click "Move To" at arrow C and it is now in your Keep folder. I wasn't thinking that the "move to" was a button. It was there but I somehow looked at it as a drop down menu like the folder name, even though I didn't ever (obviously) try to select anything since move was already showing . My bad! Also a very good tip should Jim still want to consider it, or so I think anyway.